The College Sports Information Directors of America (CoSIDA) embarked on an ambitious journey: develop a strategic plan for the organization with a diverse team representing the association, the board, and membership – and do this virtually. CoSIDA decided to partner with the Springboard team to develop their new strategic plan. We worked together to identify and conduct interviews with key stakeholders, which uncovered many accolades, concerns, and support for the journey that CoSIDA was undertaking. Over the course of 10 months, the Springboard team helped the CoSIDA Planning Team navigate through a virtual strategic planning process specially tailored for the demanding day-to-day responsibilities of the participants. Utilizing a visual conference call platform, a Google Doc, and email communications, the strategic plan became reality step by step. The planning team moved through a series of steps to evaluate its vision, mission, and value statements, to establish five critical strategic outcomes, and to craft annual goals and tactics for the new plan. The planning entailed 18 hours of dedicated tele-conference sessions, with pre- and post-session work and many internal conversations dedicated to developing a clear and executable plan. The result was a fresh and new strategic plan that represents the forward thinking of CoSIDA for the next three years. >> Visit the CoSIDA website to see the results of their hard work. In addition, we developed a strategic planning scorecard for CoSIDA to track progress against their new strategic plan. As part of the planning process, CoSIDA established organization-wide critical goal categories (or areas of focus), each with an internal champion. Their goals then hang off of these categories. Each month, the champions report progress against their goals using a “stoplight” approach and a percentage complete, and add a board-facing statement to support their quantitative report. 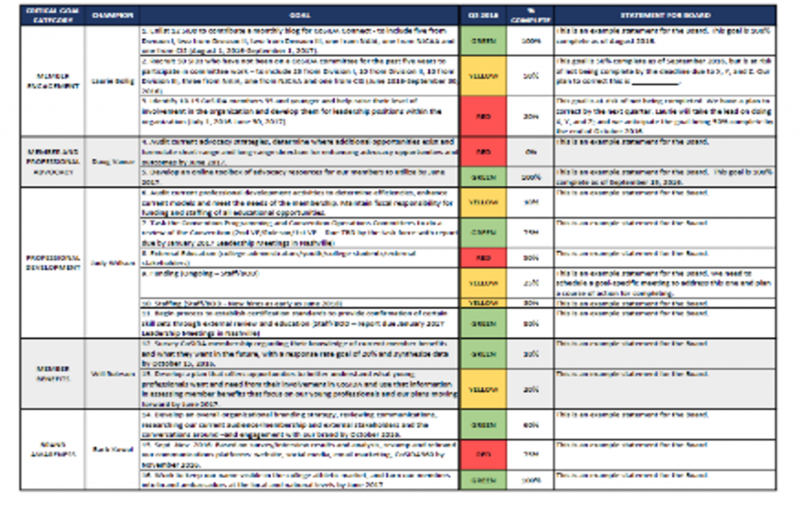 The scorecard is shared at each board meeting, and provides a quick and easy snapshot of progress against the strategic plan, and a forum for discussing specific goals as needed.